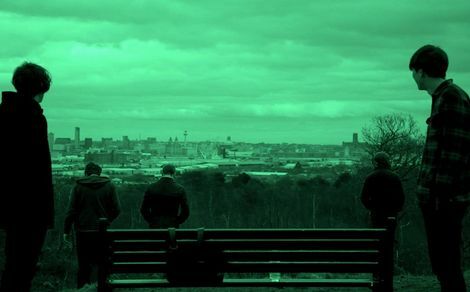 Wirral dream pop outfit By The Sea return with opening track from forthcoming second album, Endless Days, Crystal Sky. It’s been sometime in the making, however, By The Sea have revealed details of their second album Endless Days, Crystal Sky out on August 18. Endless Days, Crystal Sky, released via the band’s own imprint War Room Records was recorded in Liverpool’s Parr Street Studios, with Bill Ryder-Jones once again helping out on production duties. The album, which is expected to contain tracks including Endless Days and Youth, is preceded by lead track I See A Crystal Sky – a more robust offering than anything contained on the band’s eponymous debut record with Liam Power‘s vocals transformed from breathy whisper to a bolder, punchier affair. Elsewhere, Joe Edwards‘ glisteningly synths and Andy Royden‘s robust sledgehamming percussion are thrust to the fore trading alongside guitarist Mark Jackson‘s characteristic chimes. Endless Days, Crystal Sky features 10 new tracks – much of which will be premiered on the Getintothis and Bido Lito! Stage at Liverpool International Music Festival in August and before that at Astral Coast in July (see previews below). But for now, soak this up. Getintothis’ albums of 2014 so far: Half term report from Liverpool’s writers on the block. GIT Award 2013 Nominee profile: By The Sea. By The Sea live with Wild Nothing at the Kazimier. By the Sea album launch at Leaf Cafe, Bold Street. By The Sea named in Getintothis‘ Top Singes of 2013. By The Sea named in Getintothis‘ Top 100 Albums of 2012.